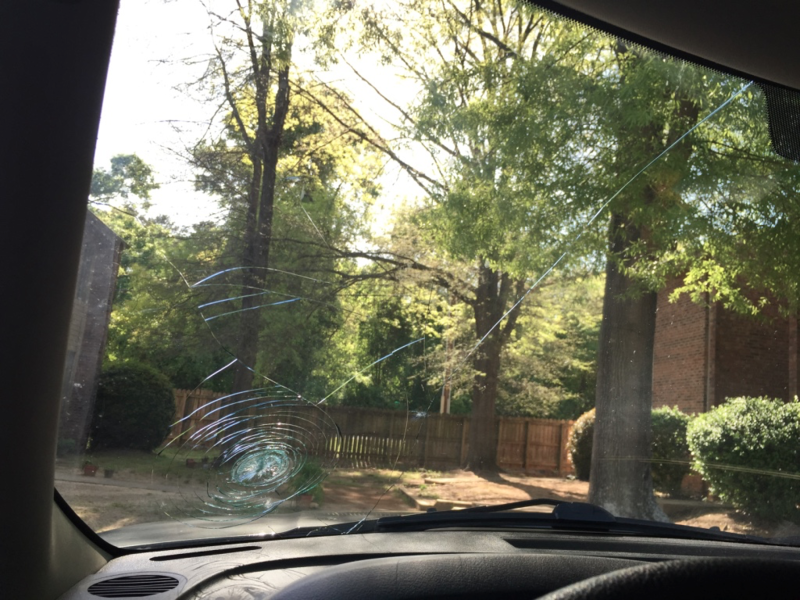 Yesterday as I was driving down I-20 at home, an unknown object was thrown from the car ahead of me and caused some serious damage to my truck and windshield and definitely shook me up (after looking, I believe the brownish object I saw was a brown beer bottle, perhaps empty). It was today in reflecting on my state of gratitude (because so many things could have happened that didn’t, I’m alive with no hurts and my truck will be fixed with relatively little out of pocket expenses to me Hallelujah), that I realized the first quarter of this year with the word "live" as my focus has produced gratefulness within me about where I am in life. I am not all the way where I want to be yet, but I am grateful to look at life from a glass 3/4ths full perspective (that’s usually how much I fill a cup) and I know that through everything that lies ahead, my life is still going upwards. I realize that for the majority of my life, I was looking at life and everything that happened to me through a lens much like this same cracked windshield. I saw things as pain, punishment, suffering, and truly all things that happened, were things I brought on myself in some way or somehow deserved (twisted right). For so long my mind was under constant attack by the enemy. Knowing what I know now, I see that the devil was plotting a grand scale attack, years in the making, so that I would be crippled for years to come to become who God desired me to be. But thank God for having His hand on me and loving me enough to not allow that fate to manifest! The truth is that the devil does that to all of us. Ephesians 6:10-12 tells us that it is our minds that are the proverbial battlefield, not the physical things we face. All it takes is for the enemy to plant a thought in your head to cause you to succumb to mass hysteria in some form and his plan to thwart your manifesting God’s plan for your life is well on its way. And it worked for me for many years. I worried and stressed and cried and overanalyzed every single thing…to the point that I already talked myself out of whatever I was believing God for in less than 5 minutes sometimes. But for deliverance and healing from that, I am truly grateful. To live and be able to fight back knowing that God has already won for me is the best revenge. I have shared with you all that my scripture focus for this year is John 10:10. I say it to myself as a confession almost daily to remind me of what I am to stand on in faith. I have truly come to understand what it means to have life to the full, till it overflows, lacking nothing. Living life to the fullest was impossible for me pre 01/01/2015. I was still so determined to control every aspect of my life. Now, I know I will do it, and manifest everything God wants from my life because I have given Him the reins to steer and lead me where He wants. It is like God has performed open heart, mind, body, and spirit surgery on me, pouring into my heart the things I needed to give me confidence, strengthen my faith and reassure me of His plans for me. I no longer am consumed with the things that the enemy was using to keep me bound. I have moments like everyone does, but I have put out APBs for any thoughts that linger to contradict God’s promises for me. I am happy now and excited for the things that lie ahead and I trust that God has it all worked out for me. For that I am forever grateful. I have gone from mouth of the south to Selective Sally Sleuth, divulging my deepest secrets and desires to God and whoever He leads me to share with and I have gone from just being a hearer and sometimes speaker to a doer. I owe it all to God. Living isn’t just going day to day doing the same mundane things. Living is getting in the trenches and getting dirty. It is a hands-on process. Living is faith for me…because I trust that God will continue perfecting me day to day, bringing those things that I need to work on to my attention. Living is a gift for me, and I love my life now. It’s amazing how losing friends and deepening the relationships with those I already had has blessed me. The old Marquita was deeply hurt when people left me or God revealed a need to let a person go. I now recognize that people’s transitions in and out of my life are just them making room for better and more fulfilling relationships, whether lasting for a season or a lifetime. I have disconnected from social media (I used to check them multiple times a day to now only going on Facebook maybe once a week or so) and in disconnecting, I have reconnected in a deeper way with those that count the most. It’s also truly amazing how God has used 4 little girls under the age of 3 to truly grow my once cold heart from the size of a raisin to what I believe is a normal sized heart now through witnessing and being a part of their lives. Experiencing their successes and being a recipient of their love has done more for me than what I thought any person could do. God has used the purest form of love to revive me, taking me a brokenhearted girl who looked to other broken people to fulfill my needs to someone capable of loving myself and others because God chose to love on me in an unimaginable way. Of course some of these things have been in the works for a while now, but its in seeing the fruit being born in my life that I truly am grateful to God. I no longer get upset when I cry because my tears are often of joy and laughter. He has used those tears to wash away the hurts and bring me back to life. It is only April. I can’t wait to see where I am by my birthday as I begin a new decade. Countdown to 30 in less that 3 months! We are on the battlefield: I also experienced this 1.5 weeks ago. I am fighting with an addiction and I really noticed that not I was fighting. Instand, god was fighting inside of me. Even so, I was in the middle of the battlefield. Sadly I had an fallback on holy saturday. (I was stressed and tired and the devil told me “You haven’t sinned for such a long time and you have to do something good to yourself”. Sadly I choose to do evil; it was no sudden attack) Since then, I haven’t noticed it anymore. God continues to bless you and to live life! Thank you for your encouraging words! APB is “all posts bulletin”, an English term for a public announcement to be on the lookout! I will keep you in prayer!